Sunday, February 1, 2015 at 2:00 p.m. This will be an interactive storytime with craft and snack for children ages 3 years and up with their families. Every year The Association of Library Service to Children (ALSC), a division of The American Library Association (ALA) awards its prestigious Caldecott medal to the artist of the most distinguished American picture book for children. This medal is named in honor of nineteenth-century English illustrator Randolph Caldecott. The 2014 Caldecott Medal went to illustrator Brian Floca for the book, Locomotive. The 2014 Caldecott Honors went to illustrators Aaron Becker for the book, Journey; Molly Idle for the book, Flora and The Flamingo; and David Wiesner for Mr. Wuffles! Previous winners can be found at the ALSC website. 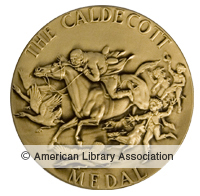 The 2015 Caldecott Medal and Honors will be announced during the first week of February at the Midwinter meeting of The American Library Association in Chicago, Illinois. The Trove is celebrating these announcements in this special family storytime at which we will be reading some of the fantastic picture books for which illustrators have been awarded this medal and it’s honors over previous years. We may even guess the winner of this year’s Caldecott Medal and Honors!